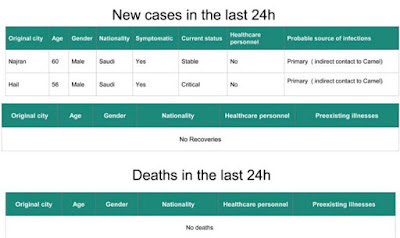 The recent uptick in Saudi MERS cases continues, with 11 cases reported over the past two weeks, many with camel exposure (either direct, or indirect). Today's announcement identifies 2 more primary cases listed as having Indirect Contact With Camels. While still relatively uncommon, Indirect Exposure to Camels has been cited a couple of times this year as a potential risk exposure. What it means exactly in these cases, is hard to know. 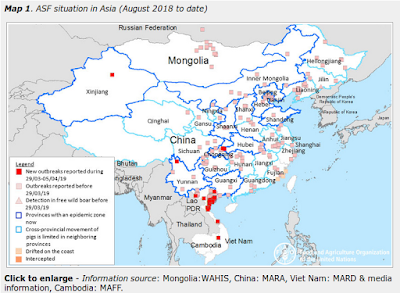 In last November's EID Journal: Risk Factors For Primary MERS-CoV Infection, indirect camel exposure was defined as having visited settings where animals were kept but without having direct contact; or exposure to household members who themselves had direct animal exposure. Although we found that direct and indirect dromedary exposure were significantly associated with MERS-CoV illness, our study had limited power to detect specific behaviors or practices associated with illness. Future studies should be designed to further explore this association. 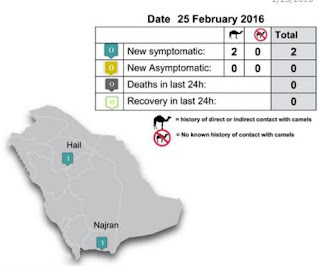 I would note that we saw a case from Najran on Feb 12th. We'll hopefully get some additional details on these recent cases in the next WHO update.